This is the 2nd portion of Serguei’s interview. 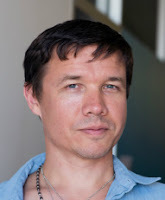 Serguei Levykin is an EFT & Neuro-Linguistic Programming Practitioner, Hypnotist, and Life Coach. Serguei excels at helping people clear their emotional blocks to have a happier life. I was excited to ask him a few questions about all the ways he's helping people overcome their fears. I know you focus on helping people get over their fear of going to the dentist, is there something a person can do while their sitting in the chair to relieve anxiety quickly? Yes, if they couldn’t tap before being called into the dentist’s room, they can while sitting in a chair use the thumb and index finger of one hand to tap on or squeeze the sides of each finger of the other hand, on either side of the nail. This technique comes from SET, Simple Energy Techniques developed by Steve Wells and Dr David Lake. Just keep tapping or squeezing each finger in a row repeating the cycle until your fear or anxiety has subsided. Of course, for long-lasting results I would suggest that you work with an EFT practitioner to address the core causes of your fear. Would you mind giving a brief overview of Neuro-linguistic Programming and how it helps with the healing process? Neuro-linguistic Programming was first developed in the 1970s by Richard Bandler and John Grinder from their study of such highly efficient psychotherapists as Milton Erickson and Virginia Satir and from modelling of some of their approaches and it has evolved into a large collection of communication and psychotherapeutic techniques that can help influence the subconscious to cooperate with the conscious in achieving your desired outcomes. I mostly use the communication techniques, such as matching, mirroring, leading and pacing, as well as questioning, and such aspects and patterns of NLP as sub-modalities and reframing to get to the core issues and I use EFT for the actual clearing of emotional patterns and beliefs. I also use future-pacing from NLP, amongst other things, to test the results. I also see that you incorporate hypnotherapy into your practice, when did you first start using hypnosis? What are the benefits of using hypnosis? Although I have learned self-hypnosis when I was still in high school, I formally learned hypnotherapy in 2005. As I have mentioned, I have been fascinated with hypnosis since I was about 11, and I see it as a great tool for communicating with the subconscious, uncovering hidden memories and the events that have led to the development of current emotional patterns and beliefs. It is also great for installing new resourceful patterns and beliefs after clearing the negative ones with EFT, with full cooperation of the client, of course. Do you have any specific tips to help people to start feeling good about themselves? Of course, the first thing I would recommend would be tapping / EFT for clearing negative emotions and beliefs out of your life. Identify a specific negative belief about yourself, or an emotion you feel towards yourself on a consistent basis, and try to find a specific event in the past that has first brought this on, and start tapping on it. For example, you may uncover a negative belief about your body or your appearance that prevents you from feeling comfortable in social situations. Ask yourself, “Where did I first learn this?" or "When did I first started doubting my physical attractiveness?” A memory may come up of a situation when your parent, or friend or someone else who was significant in your life at the time made a remark or even looked at you in a certain way that you interpreted as being disapproving of your appearance. Start tapping on your negative feelings about it, and tap until you have cleared them. You may need to tap on several memories that contributed to this, or more than one emotion around those events, but ultimately you will be free if you persist with this. Being as specific as you can is the key. Even better, find an EFT coach who can help you with this work. I would also suggest that you learn to ask yourself better, more empowering questions, such as “What’s good about me?”, “What is unique and special about me that I really appreciate?” , “What could I be happy about right now if I wanted to be?” or “What am I grateful for right now?” etc. Ask these kinds of questions every day and don’t stop until you come up with at least 5-10 preferably new answers. You will soon notice that this too will start changing your habitual thinking and feeling patterns, and you will start feeling much better about yourself and about your life. Thank you Serguei for all the amazing information! You can visit Serguei’s website here. Next week’s interview is with Jason Stephenson founder of Relax Me Online and relaxation guru! Please check back next Tuesday to learn about meditation tips to help you relax. I hope you’ve learned a bit more about Emotional Freedom Techniques and ways to de-stress. For more information on EFT check out my website as well. Thanks for reading! Today’s interview is with Serguei Levykin an EFT & Neuro-Linguistic Programming Practitioner, Hypnotist, and Life Coach. Serguei excels at helping people clear their emotional blocks to have a happier life. I was excited to ask him a few questions about his work, hypnosis, and techniques he teaches to help people quell stress! When did you first discover Emotional Freedom Techniques? The first time I had heard about Emotional Freedom Techniques (EFT) was in 2003, when I attended the annual Anthony Robbins’ Leadership Training in San Diego. This event is usually taught entirely by Tony’s staff, however Tony occasionally used to make an appearance if he wanted to share something interesting and important that he had been experimenting with. Our group got an introduction to TFT (Thought Field Therapy) and EFT directly from Tony, although I didn’t quite get it on that occasion, perhaps because it was so radically different from everything else that was taught in the course and there wasn’t enough time to explain it properly. A couple of years later I got a better explanation from Rod Sherwin from Melbourne, Australia, whom I knew from crewing Tony Robbins events together and who had then recently become an EFT practitioner. I was so intrigued that I ordered a full set of Gary Craig’s EFT DVDs shortly after. What made you want to become an EFT practitioner? Ever since I first discovered the power of hypnosis to change people’s habitual behavioral patterns, at a stage hypnosis show that I attended when I was in primary school, I have been passionate about finding ways to help people overcome their limitations and achieve their full potential. I had studied a lot of self-development materials and popular psychology books and attended a lot of workshops and seminars before finally achieving my dream of studying hypnotherapy several years ago. I have also completed my Neuro-linguistic Programming certification around the same time, and studied coaching. To apply my new skills I spent a couple of years training with and volunteering at Lifeline, a government-funded telephone counseling service for people in crisis situations, and I practiced on friends and family. I still did not have the courage to go professional though, until I absorbed myself in applying and learning EFT. Its simplicity, ease of use and efficacy blew me away. It helped me resolve several personal issues and I knew I could help a lot of people with this tool. I realized that I had enough training and experience to start working with people, but I was still lacking some formal training in EFT, so I signed up for AAMET approved Level 1 and Level 2 courses, and found a mentor and that was the start of my professional EFT practice. Do you feel when you first started as a practitioner people were skeptical about trying EFT? Was there something specific you said or did that made them more willing to give it a try? At the time when I started working with EFT people were becoming more aware of EFT and tapping, so it made the job of convincing them easier. With the skeptics experiential approach seems to work best. Usually I mention and refer them to the existing research on EFT and then suggest that we try to use EFT on an issue that they have unsuccessfully tried other approaches with. Most people that I have worked with have been open-minded enough to try it and to experience the results for themselves. What kinds of things do you typically help people work through with EFT? The majority of people that I have worked with so far needed help with stress and anxiety, relationship and heartbreak issues, getting clarity on what to do with their lives at the times of transition, as well as resolving traumatic memories and events from the past that caused fears in the present. These have included fear of dentists, fear of public speaking, fear of making changes, as well as fear of flying and of snakes, and many more. We all fear something and EFT is one of the best tools for overcoming fears and phobias. This is the first part of Serguei’s interview, don’t miss the 2nd part which will be posted Saturday August 24, 2013. Thank you, Serge, for all the amazing information! You can visit Serguei’s website here. I so agree with what Serguei says about us all fearing something, because we do! It's a natural human response to danger, or what we deem dangerous. Fear can lead to so many other detrimental issues from phobia's to health problems. This is why I recommend at least trying Emotional Freedom Techniques (EFT) to start releasing the fear. Please visit my YouTube Channel for helpful EFT videos.